Thanks for looking at this project. Comments and suggestions are always welcome. I will reply to all of you Lumberlanders out there who take time to “have your say” in the next 24 hours, so check back for feedback. 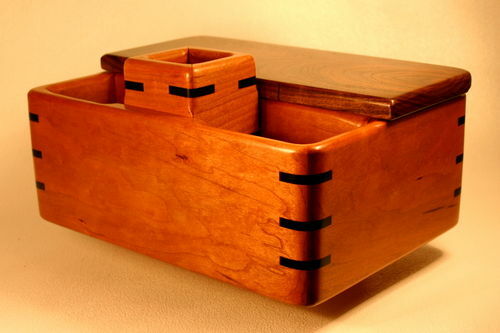 There is a tutorial index at the end of this posting that will show you how to build the jigs and learn the techniques for building boxes like this organizer. 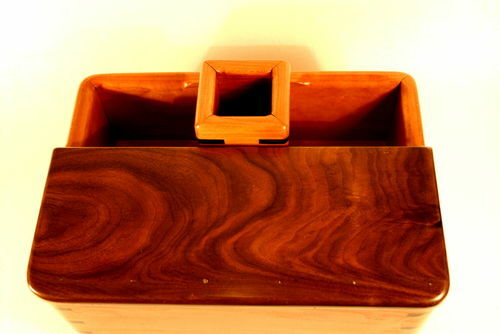 Pictured: A Black Walnut and Black Cherry bedside organizer (11 1/4” L, 8 1/2” D, 5” H) with Wenge corner splines. The back half has a hinged lid. The front has a 3” square “tube” that serves as a spacer. The slight lip on the back side above the hinge serves as a stop for the lid. The “tube” is held in place with two screws that go between the bottom board in the tube and the bottom board of the larger box. Story: Of course this will not apply to you younger people in Lumberland, but many of us older men find that we need to make some evening trips to the bathroom. And then there are those Tums or other meds you may want to find at 4:00 in the morning. I just got tired of knocking everything over and onto the floor in the middle of the night. (My lovely wife got tired of it as well.) So, I thought I would build a box to solve the problem. Since I build and sell boxes, I figured that if it was something I needed…other people would need it too and would buy a box made like this. I’ll let you know how sales of this design go. I have tried some other configurations. Focus: As some of you know I am a big believer in boxes being useful and having a purpose. Potential customers look at boxes that are pretty, but seem to buy boxes that do something. Boxes that hold teabags, jewelry, cards, pills, saw blades, tools, cell phones, keys, suggestions, wedding rings…you get the idea. If I can use it to organize my life, I can sell it to others. If you find something in your life that needs organizing, build a box to solve the problem. Nice box and some great colors. I try to get organized everday just a little more. Another great looking box and a good solution for organization. Good to hear from you, as Spring ‘breaks on thru to the other side’ in Indiana. Another Beautiful box and organizer. 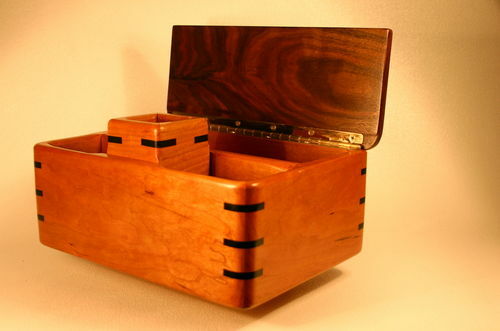 Beautiful wood and practical design, excellent craftsmanship as with all Your boxes Al….thanks for sharing. What an ingenious and interesting box! Often we are like the cobbler who’s children have no shoes… we make for everyone else but us. As always… fun to watch. When I make my tea boxes, I always extend the back a 1/4 inch as a stop as you did. It makes for an interesting and useful top. Ken, getting more organized each day is a great goal. “Entropy” can be loosely defined as the tendency of any organized system to work its way toward its most disorganized state. It can be applied to what Nature does in the universe and seems to apply to my shop and life as well. This is the time of year I clean up and put away all the stuff that floats around in my shop and sometimes my life. Boxes are a great way to war against entropy. Len, always good to hear from the Nabb contingent in Lumberland. Just when we thought spring was here, we dipped below freezing last night. Dave, you did a great job on that lathe bench. I see you are moving steadily toward having 3,000 posts on this site. That is really a lot of work. Keep boxing and keep posting. Ellen, in some strange way your cantilevered box was the reason for the square “tube” on this series of boxes. That post was great. I loved the shoes story, but I have a twist on that. The nice part about being a box “cobbler” is that I can make every box for myself, and when I make one that is the best yet I keep it and sell the ones that lead up to it. 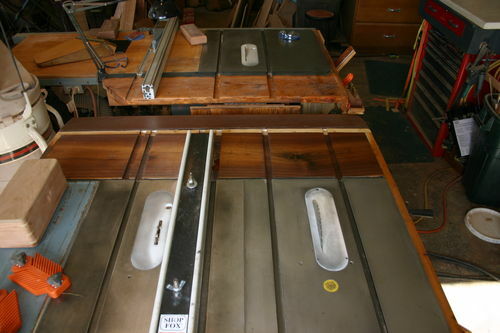 This is my fourth try at building an organizer…the other three are for sale. There may be others. Ellen, I always enjoy your work and your thoughtful comments, thanks. A real beauty as usual Boxguy, and your jigs age like a fine wine, they only get better with each read! Al, that is a very stylish box. Nothing better than building something to custom fit ones needs. I love making things for people who know what they want. Your rounded out edges are something I need to start doing on my boxes, seems to give it more class, but I do like the square corners too. Nice work. Very.. very nice Big Al and yes I know exactly what you mean, my dad is 81 years old and he was adamant and specific about what he wanted by his bed side, his choice was a 3 part divided tray, just a simple partitioned tray in which I made for him, myself I’m using one of my simple valet boxes beside my bed. Steve, Thanks for the comment. I liked your sled post and the fact that you modified and improved it after you had used it a while. Charles, glad the jigs are useful. Your “USS Fencerprise” was a fun read. I too have kept an old Craftsman saw that my dad used. I keep it set up permanently with a dado blade that cuts a 1/2 inch groove for the bottom of my boxes. Recently, I yoked it with a Delta saw I bought on Craig’s list. In my never-ending quest to avoid set up time when making boxes, I keep a Forrest #1 grind blade in the Delta saw. It makes flat bottomed 1/8 inch cuts for smaller splines. 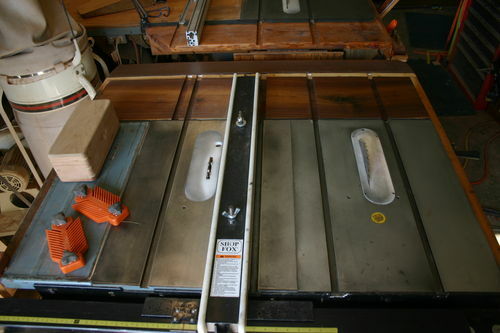 Yoking these saws was more space efficient than adding wings on the Craftsman saw. The yoked saws serve as a off bearing table for my Unisaw workhorse and I use these saws as an assembly table for larger projects. Dave, I like to round corners. Here is why. Why round box corners? Your raised panel boxes are spectacular. The “crap box” post was funny. Nice work. Blackie, glad to know you are using some of your own work too. Those valets you make are a great design. It’s a beautiful piece. I love your work. Great Box Al! interesting design, she will sell well. Thanks for the tips and info, nice to see how a pro does it! Beautiful gorgeous, well conceived and executed. I have read many of your tutorials and am employing your methods as I write this. Thanks for all the great information. Al, your boxes are always the best. I use many of your tutorials in my box work. Most helpful! Thanks for all you do.